Are you our next co-director? Paid opportunity with EAP! WE'RE NOW SEEKING A COLLABORATOR FOR A NEW CO-DIRECTOR. Everyone send Katherin a big, warm CONGRATS! Her work and efforts are exemplary of the love she has for Bay Area Arts and our communities, whether it's the arts, our neighborhoods, and of course, the network. Bravo! Help us make our mark on Tuesday May 3, 2016. Get ready for a 24 hour day of giving in which the East Bay Gives platform raises money for local nonprofits community-wide giving challenge Alameda Contra Costa. Follow our progress with #EAPxEBG! The Flight Deck is a shared performance venue in the heart of Downtown Oakland where artists of all kinds work, play, and learn. It houses several arts organizations and features a theater, rehearsal studio, gallery and co-working office​. We are located at 1540 Broadway, between 15th and 17th Streets. The Oakland Symphony, Youth Orchestra and Chorus bring together orchestral music, choral music and youth education to strengthen the Oakland/East Bay community by providing quality live performances, education for lifetime enrichment and the perpetuation of the performing arts. SAVE THE DATE. Mark your calendars for EAP's very own convening! Multicultural Arts Leadership is hosting it's 3rd Annual Art/Life Forum! | How do we go from surviving to thriving? Arts professionals in the Silicon Valley face the daunting task of trying to create, engage audiences, and fundraise in the midst of rising living costs and displacement. The third installment of the Multicultural Arts and Leadership Institute’s Art/Life Forum will be focused on how local arts professionals can go from "Surviving to Thriving". Follow us online! We actively post job opportunities on our Linkedin, events that come our way on Facebook, and up to the minute updates and thoughts on twitter. Click below to join the fun and connect! 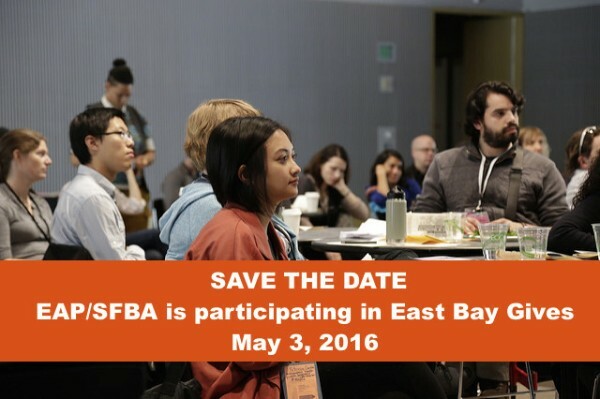 Emerging Arts Professionals/SFBA is a network focused on the empowerment, leadership, and growth of next generation arts and culture workers in the San Francisco Bay Area through knowledge sharing, learning opportunities, and partnerships. EAP/SFBA is a member of the Intersection Incubator, a program of Intersection for the Arts, providing fiscal sponsorship, incubation and consulting services to artists. Visit www.theintersection.org. EAP/SFBA is funded by the William and Flora Hewlett Foundation, which supports education, culture and the performing arts to address serious social and environmental issues of today's society. Visit http://www.hewlett.org/. Copyright © 2016 Emerging Arts Professionals / SFBA, All rights reserved.